What is a Flow Manager? 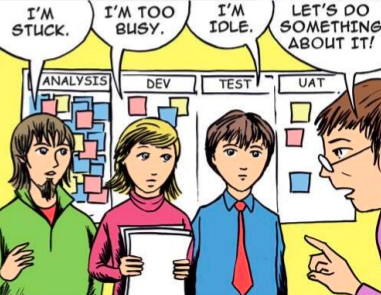 Cover image from David Anderson’s Kanban book. The character on the right is the persona for a flow manager, in my conception. Agree to pursue incremental, evolutionary change. How do teams continually improve and mature toward greater fitness for purpose? That’s something we at Asynchrony are keen to discover. One recent experiment to catalyze improvement that we’ve started at Asynchrony is the trial of what we think is an emerging role in our particular work culture: flow manager. The flow manager’s role does not actually exist in the Kanban method (there are no prescribed roles whatsoever), but – in Sandvik IT’s context – we found out that there is the need for someone from within the team to take charge for the implementation to stick. The role has some similarities to a Scrum Master role, once removed from the project management aspects it often is loaded with. The purpose of the flow manager is to make the team reflect and act: follows the policies it has created, create new ones when needed, discuss and act on exceptions (issues and opportunities), experiments to find creative solutions, etc. The flow manager inspires, challenges and coaches. This role really is an extension of the coach and is meant to take over when the coach phases out. Kanban is a change designed to be led from the middle. Bottom-up initiatives tend to stall with only local improvements and boards that are best described as team (or personal) Kanban. Without middle-management support to improve service delivery to external customers there is generally no momentum to look at the whole workflow and focus on improving flow of work. … this [someone being available to respond right away] means focusing on the process as it operates from beginning to end, not only at the completed component or finished goods end. That’s why lean designs require so many team leaders to maintain the process, to spot problems in upstream intermediate or subprocess areas, and to respond right away to prevent or minimize missing takt [rate of customer demand] at the outlet end of the process. An integral part of the lean management system is having the appropriate number of team leaders on the floor to focus on the process. It requires a leap of faith not to scrimp on this crucial part of the system; having enough leaders available to monitor the process, react to problems, and work toward root cause solutions is an investment that pays off in business results. But at first, and from a conventional perspective, team leaders just look like more overhead. Our teams understand kanban as a visual-management practice. Nearly every team has a kanban board. But until recently most teams haven’t fully understood the values and benefits of the kanban method. New hires play the Get Kanban game. But the learning sometimes fades away once they start work and they get busy delivering. After conducting a depth-of-Kanban assessment for a few teams, we found that though people are indeed interested in improving, they don’t necessarily know where to start — or how to continue. Earlier, I used “mature toward greater fitness for purpose” rather than “evolve toward” intentionally: In my experience, teams don’t evolve (which implies a kind of passive or natural course) so much as they intentionally mature toward bettering themselves and their delivery. It’s a matter of intentionality. We needed someone to provide that intentional and disciplined approach to improvement, the flow manager. We see the flow manager as a catalyst of change within teams that believe themselves too busy to focus on improving. Mann also writes about how bad habits are less “broken” than they are “extinguished.” We see the flow manager as a bad-habit extinguisher. So what would you say you … do? Daily At standup, ask: Are you seeing flow? Where do blockages repeatedly occur? Our teams generally practice standup meetings and are self-organizing enough to ask the first question. But beyond identifying what is stuck, teams don’t focus on the other, just-as-important, questions. Mike asks, “What if this kind of leadership doesn’t come naturally to your organization? This is where the flow manager helps. *The flow of work items through each state in the workflow should be monitored and reported – often referred to as Measuring Flow. By flow we mean movement. We are interested in the speed of movement and the smoothness of that movement. Ideally we want fast smooth flow. Fast smooth flow means our system is both creating value quickly, which is minimizing risk and avoiding (opportunity) cost of delay, and is also doing so in a predictable fashion. Hi. Muralli here. I am a flow manager. Pls do send me more information on flow manager,s role and useful tools. Thanks.